This piece is part of the "Heritage Media Collection". This cabinet's straight lines and simple profiles reflect a modern aspect. 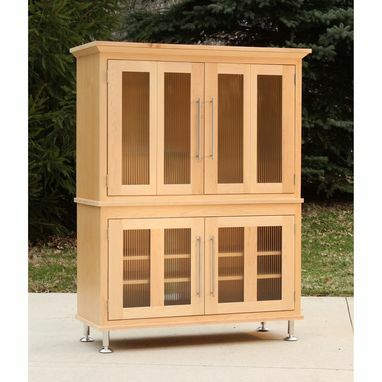 It is accented with stainless steel legs and hardware. The doors are inset with fluted glass. The TV compartment is sized for today's widescreens with plenty of space below for components. Also in the "Heritage Media Collection" is a coffee table and an end table.